Kirsty Gallacher is a popular British TV presenter who has worked with various media outfits. The presenter started out in 1996 with Sky and worked with the outfit for so many years. It didn’t take her too long in the job before she got her big break with Sky Sports in 1998. It has been an awesome career for Gallacher as she continues to climb up the ladder. Here are lesser known facts about the former Sky Sports presenter. She was born on January 20, 1976, in Edinburgh, Scotland. Gallacher started her career in 1996 when she came in contact with Sky deputy head Mark Sharman. She became a production assistant that year. Shortly after, she ascended to Sky Sports editorial assistant. Gallacher moved to Sky Sports screens in 1998 when she became a presenter for the outfit. She was the host of Kirsty’s Home Videos on Sky 1 for four years starting from the year 2000. In the popular show viewers often sent in home videos for screening, similar to what was done on ITV’s You’ve Been Framed!. She was also a presenter for the morning show RI:SE in 2002. Simply the Best was the next show to be added to her work records in 2004. The following year she presented the All-Star Cup on Sky1. Several sports shows followed after her appearance on Sky Sports News as a presenter. Some of them include 90 Minutes, Soccer Extra, Kirsty and Phil (on BBC Radio 5 Live) and many others. Kirsty Gallacher was a presenter for Only Fools on Horses, a BBC reality TV show. She made an appearance on Who Wants to Be a Millionaire in August 2008 alongside Duncan Bannatyne. In 2010 she was a guest presenter for GMTV with Lorraine in August and also presented the show Lorraine on ITV Breakfast. 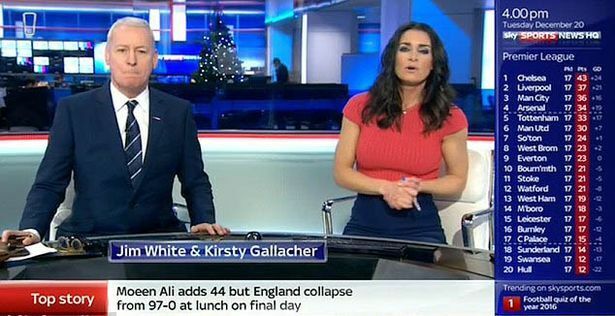 Gallacher made a return to Sky Sports as a presenter for Sky Sports News in May 2011. While she was still a presenter at Sky Sports, Kirsty participated in the Strictly Come Dancing show in 2015 alongside professional dancer Brendan Cole. They, however, finished eleventh on the show after leaving in the sixth week. Kirsty Gallacher worked with Sky Sports until 2018 when it was announced that she was leaving the media outfit. Kirsty Gallacher has her net worth estimated at $3 million. Though it has not been revealed, the talented presenter earned an attractive salary during her time at Sky Sports. Kirsty grew with the media outfit and also contributed a great deal to its growth. For her outstanding works and contributions, Gallacher has earned lots of recognition and accolades in the course of her career. The TV presenter won the award at the 2002 Television and Radio Industries Club Awards for Satellite/Digital TV Personality. She also won the 2003 Satellite/Digital Programme award for her popular show Kirsty’s Home Videos. In 2002 Kirsty Gallacher won a Platinum award at the Houston International Film Festival, for Best Entertainment Programme. The TV personality enjoys a comfortable life despite experiencing financial challenges from her divorce. She was born to her parents; Bernard Gallacher and Lesley Gallacher. Her father is a former Ryder Cup captain. During his active years, the family moved with him to Virginia Water where he worked for Wentworth Golf Club. At the time they moved, Kirsty was 18 months old. She is an older sister to two of her siblings. Kirsty is an alumnus of Coworth Flexlands and also attended St George’s School in Ascot, Berkshire. Kirsty Gallacher has got the right body that fits her daunting showbiz career. She not only has the face but a nice body to go with it. She stands at an average height of 5ft 5in (1.67m) which is quite proportional to her weight of 56 kg. The presenter is known for her ever cheerful look and her nicely shaped athletic figure. Maintaining a good figure may be quite a challenge for many but this is not the case for Gallacher. She maintains a healthy lifestyle which includes healthy eating habit and workout sessions. To justify her love for fitness, Kirsty owns a fitness gear line called Proskins.